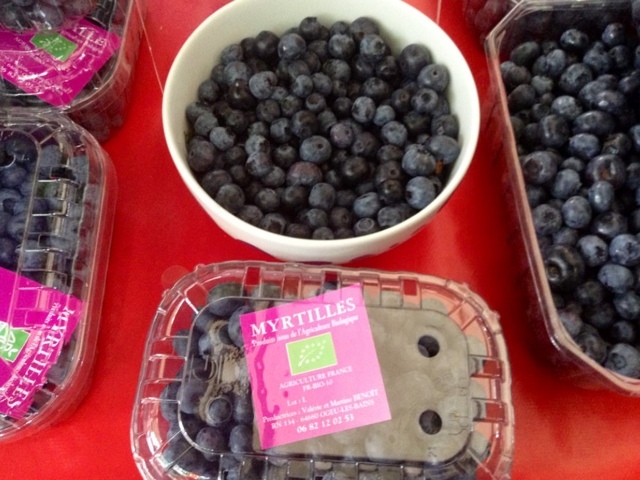 Raspail Bio Marché on Sunday - this producteur has nothing but myrtilles/blueberries + jam and juice. We ate them as we browsed. Yesterday I ran out, broke down and bought a slew of Summer fruity pastries, for research of course. The Patisseries will be closing up tight for the month of August!! Tragedie is around the corner. Just browsing this divine Charlotte. Luckily the glass came between us. It always seems to be permanent Summer in Provence no? 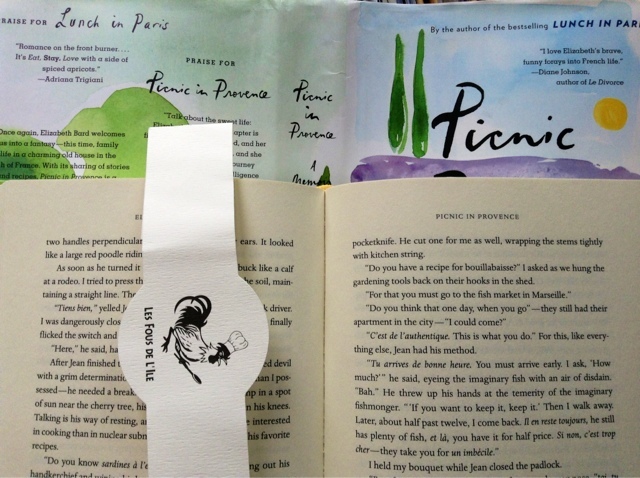 I'm deep into the perfect Summer read, PICNIC IN PROVENCE. You can dip in anywhere and immediately you're drawn into daily life in perpetual Summery Provence living. Author Elizabeth Bart takes you inside her head, heart and outside to smell the roses. Then to her kitchen to cook up recipes full of local ingredients. All your senses will be enticed.Read more about author Elizabeth Bard HERE. 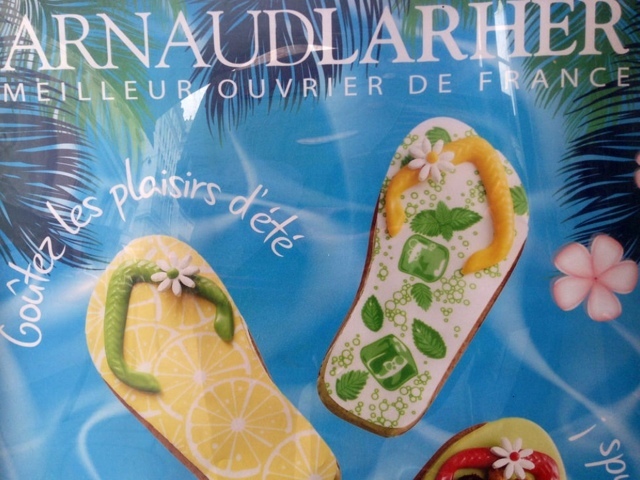 Edible flip flops/Les Tongs at patisserie Arnaud Larher (open all Summer on rue de Seine). Seen in the street, good ole sneakers with 40s style SHORT SHORTS. 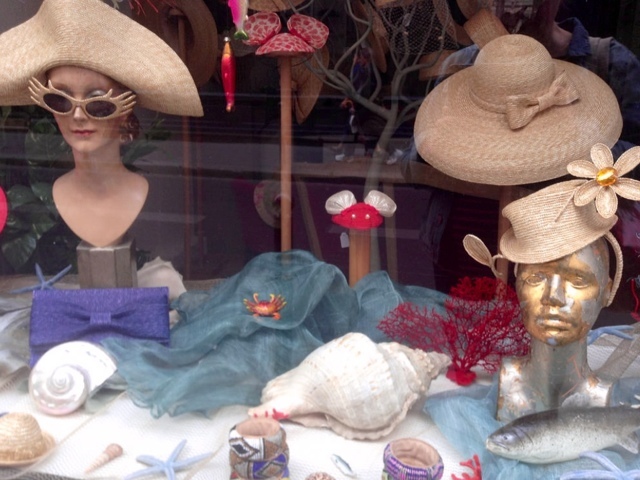 A slash of red hanging out does the trick for Paris Summer. 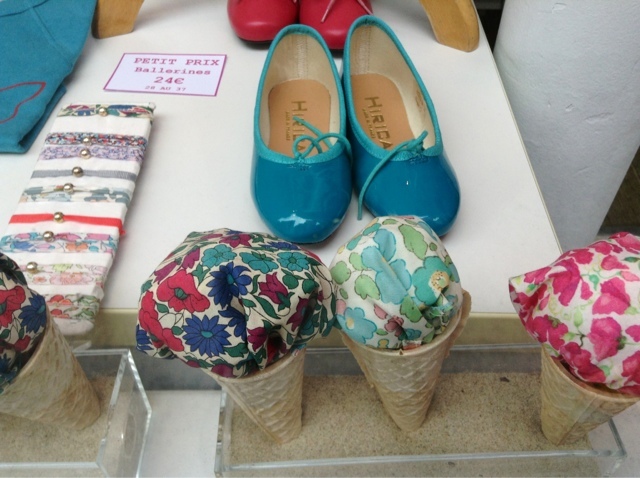 Turquoise ballerinas, ice cream cones full of Summer prints. Soon to be schoolbooks and satchels. 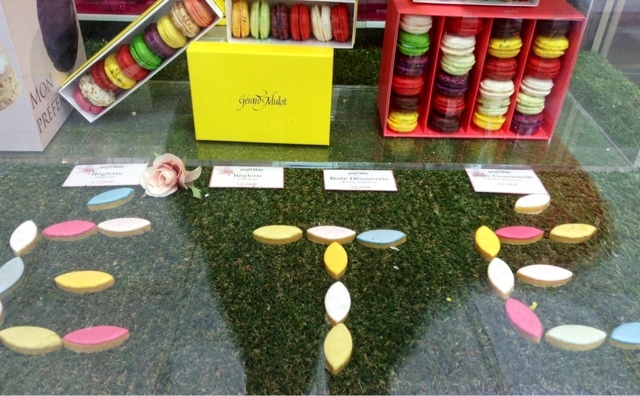 Calisson ETE in patisserie Gerard Mulot vitrine. They closed up yesterday for vacance. Sunday a bit of Summertime Paris drizzle. 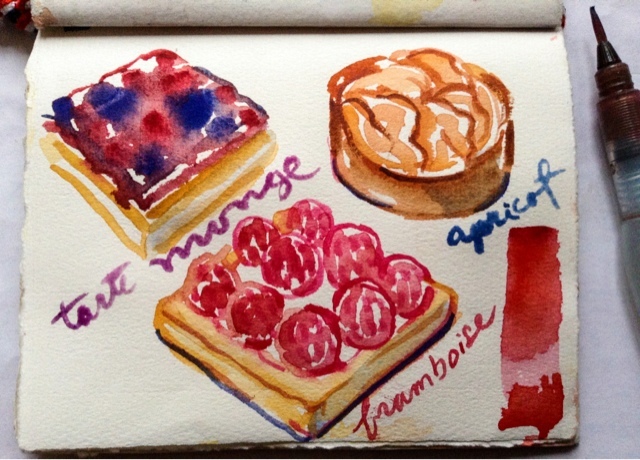 "summer fruit pastries, for research of course." OF COURSE! Hmmm...me thinks you do not take me seriously!? I SHOULD taste one shouldn't I Barbara..? 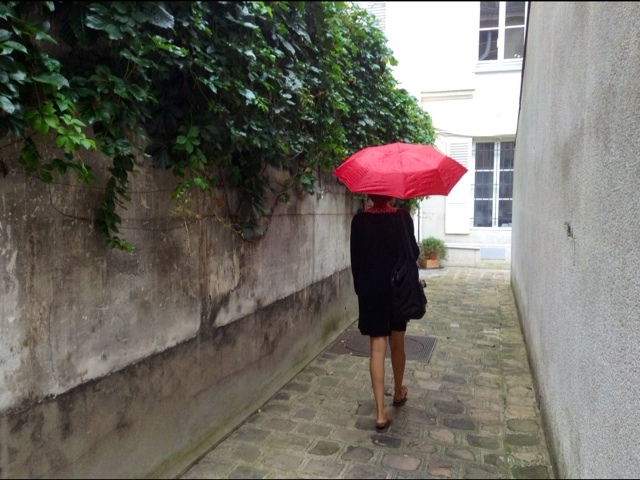 I MUST get a red umbrella - Love it! 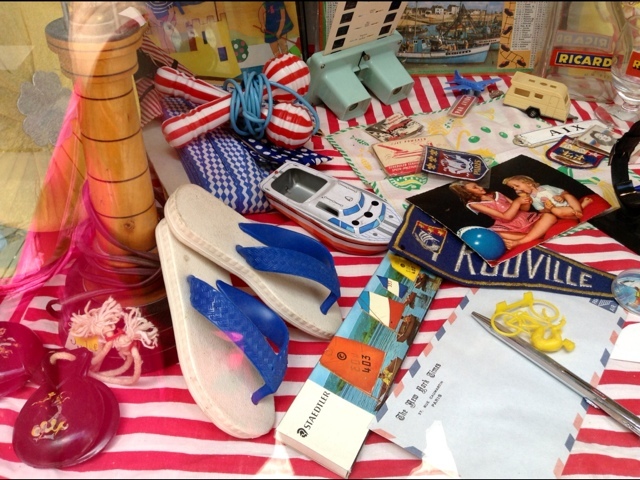 Fun seeing your pic of Scaramouche..
Those pens:)The edible flip flops:) and your art.. 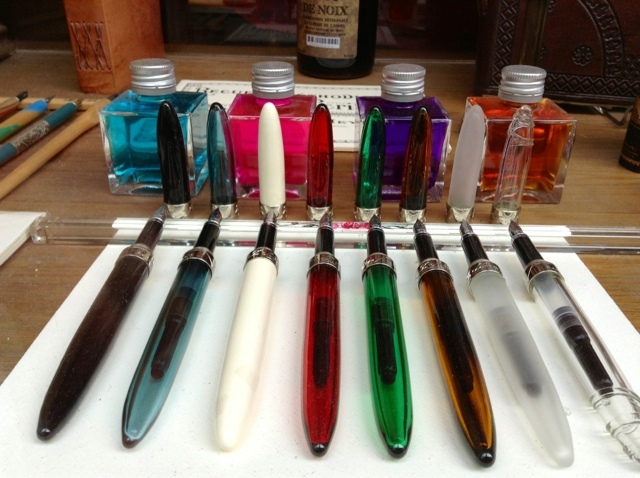 I have fallen in love w/ a pen/ink site..Goulet you surely know it? 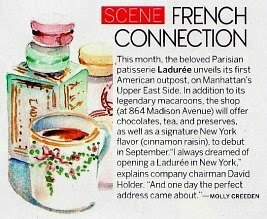 Carol, I loved this tribute to the joys of Paris as July starts its farewell tour. It's been a great summer for berries over here, too. 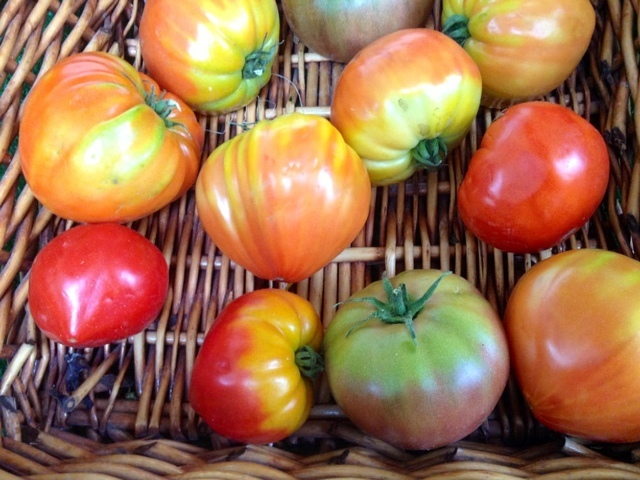 Peaches and nectarines are moving in on the beautiful, sweet berries now. Fun to see those summer ink colors in the pens. Just yesterday I amused myself for a couple of hours by resussitating my favorite old fountain pens that had been recently cast aside in favor of various gels. Great to now have the old Parker and Waterman filled and ready to write with "mysterious blue" ink. I'll have to be on the look out for some lovely summer inks. Like ice cream cones, we don't have so many nice stationery/pen/ink shops as in past years. We've had peaches and apricots since June but today I tasted a peche de vigne - violet furry on the outside and spotty on the inside...interesting. The varieties of summer fruits are endless. Wow! Never been to Paris in summer...thank you for portraying it so well! Looking forward to being back in the city of lights over Thanksgiving. Love Elizabeth BARD's books. 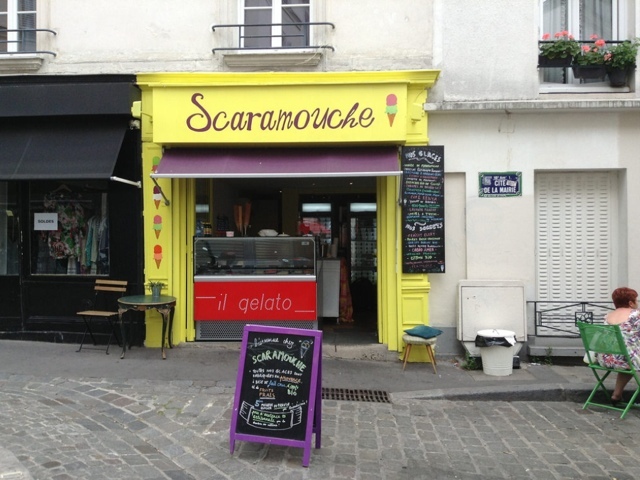 So nice they have opened a Scaramouche in Paris. 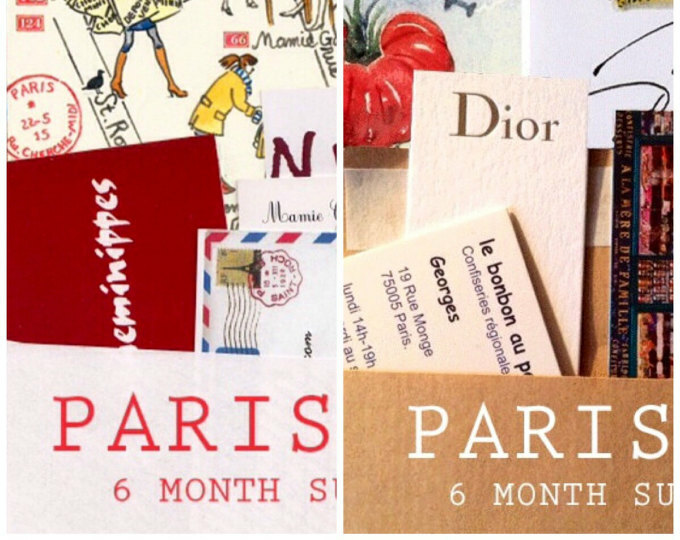 I can think of nothing better than dividing your time between Provence and Paris! I used to avoid Paris summers like the plague Bonnietoo. 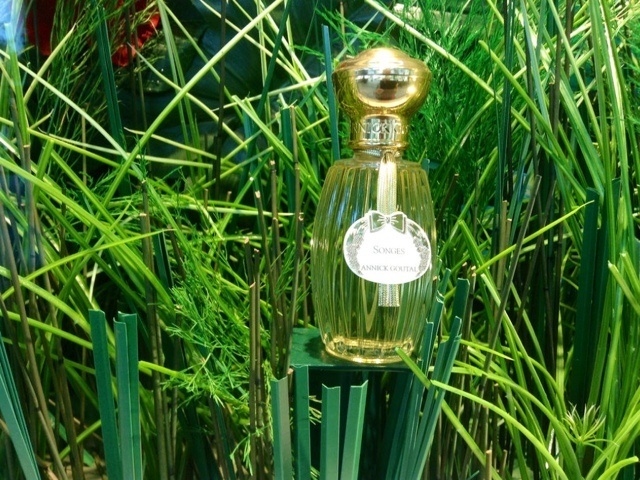 How wonderful that all looks.You always have such a fresh view on the vitrines of Paris Carol. I'd have to rush in to Arnaud Larher and try those thongs. Are they thong shaped eclairs? I'm too curious. 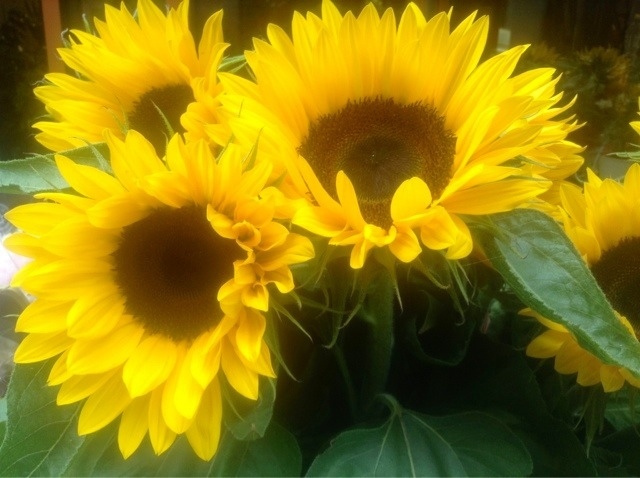 Carol, I just love your blog and look forward to getting it every week! I love the slip of red under the sweater and the red umbrella. I wish we would get some rain here in California. The prices will blow you away too. I love those flashes of red! 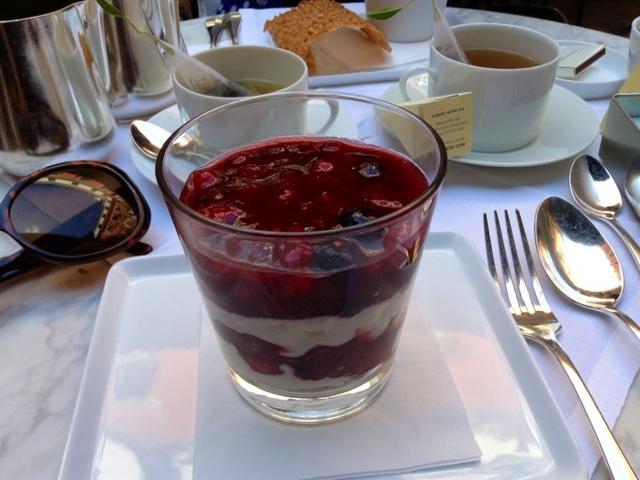 And all those delicious berry treats looks so refreshing and yummy. I agree about the flashes of red, the tomatoes, ice cream, the girls and the sidewalk sales; but the opening shot of the boat, river and island is my favorite! 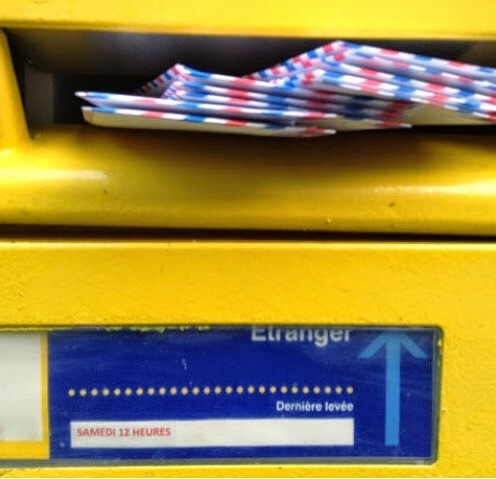 Pas de panique! 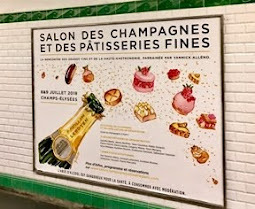 There are always boulangeries open in August -- law requires that residents be able to get their bread every day, so businesses have to coordinate. Most bakeries that close post a sign of the nearest open bakery. It's true that choices are more limited, but then custard creams and chocolates aren't at their best in hot weather, are they? You'll survive! 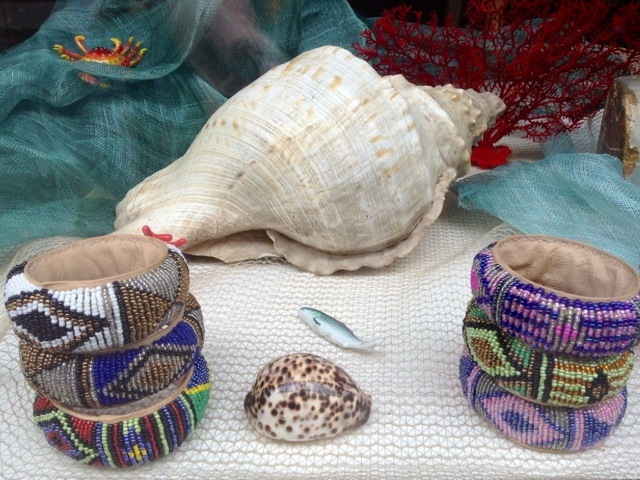 Is that your silver sandal reflected in the Montmartre ice cream shop? 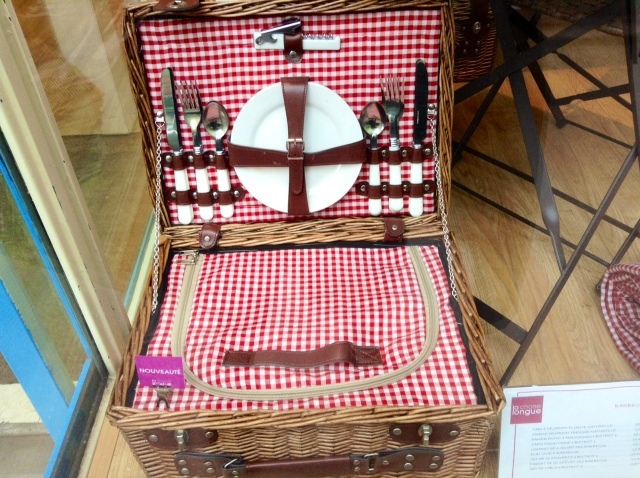 The perfect picnic basket!. Don't you just love eating and drinking out of real glass dishes when out for a picnic? Not as convenient as paper but who cares. Flying out tonight, too bad Paris is only a transfer place for me. Today's mail brought me a lovely Paris Letter with some refreshing scoops of ice cream and other charming images. Thank you!! 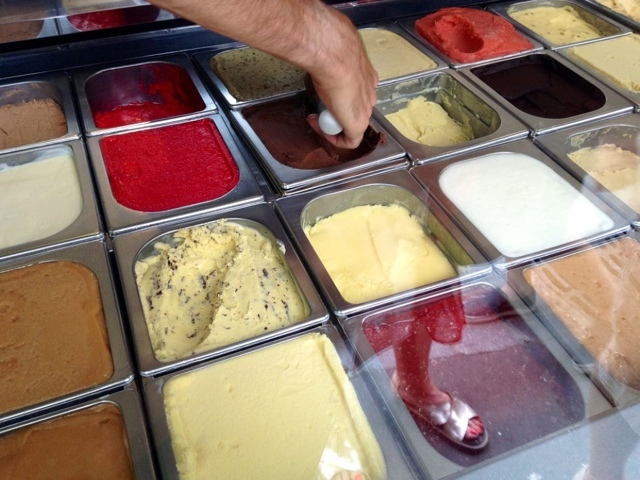 Refreshing scoops of ice cream are ever available in the Summer in Paris. Sandals not so lucky there...they sell out early. You have to plan ahead in France. 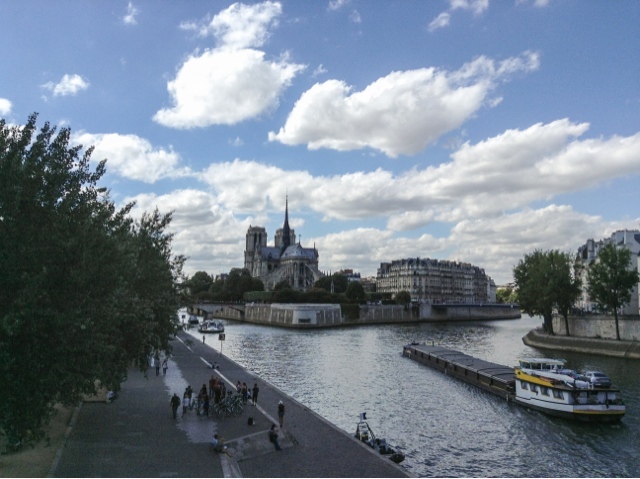 You've captured summers in Paris perfectly. :) Love your watercolors, as well! Would love a print for my apartment!! 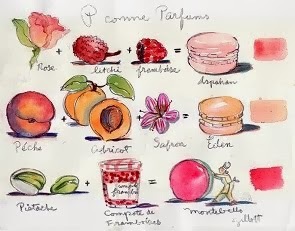 I got excited when I saw the picture of Scarmouche because I read about it in the fabulous Picnic in Provence (cook)book. 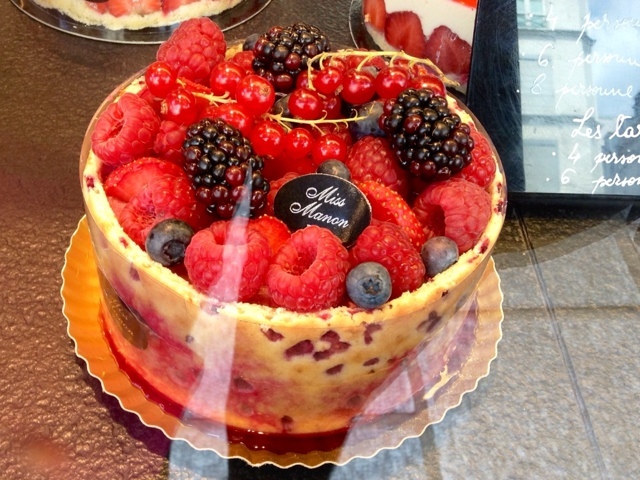 I am a fan of your blog and love France!